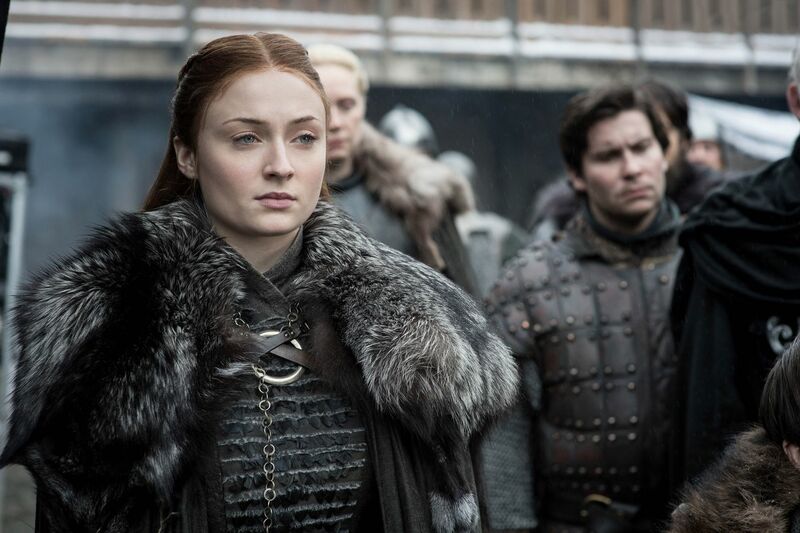 Sophie Turner as Sansa Stark in HBO's "Game of Thrones," which began its eighth and final season on Sunday. Spoiler alert: This post contains specific plot details of Sunday’s eighth-season premiere of HBO’s Game of Thrones. Don’t let me be the first to tell you what Daenerys told Sam. They’ve been to hell and back, but the women of Game of Thrones are winning the war for the best lines. Sunday’s eighth and final season premiere opened with a scene that hearkened back to the show’s very first episode, when another monarch arrived at Winterfell (and another small boy climbed high to see the retinue). And if I ever doubted that the spirit of Catelyn Stark lives in her older daughter, the look on the face of Sansa Stark (Sophie Turner) as she reluctantly welcomed Daenerys Targaryen (Emilia Clarke) would’ve put that to rest. So much side-eye. And then there are the housekeeping issues. It’s not cheap hosting royalty, and royalty that travels with armies and a couple of dragons? Who keeps that much food on hand? “What do dragons eat, anyway?” Sansa asked at one point. “Anything they want,” replied the smug young queen. Later, as Sansa and her first husband, Tyrion Lannister (Peter Dinklage), have a charmingly awkward reunion, the character who used to have all the show’s best lines paid her a compliment. “Many underestimated you. Most of them are dead now,” he said. Sansa’s past falling for any man’s flattery, and seemed almost amused that Tyrion believes Cersei is sending her army to help them in the war against the Night King, telling him, “I used to think you were the cleverest man alive." Jon Snow (Kit Harington), who is decidedly not the cleverest man alive (although, in fairness, he’s alive for the second time), tried to bad-mouth Sansa to Arya (Maisie Williams), something that would’ve been a winning strategy way back in the first season. Do try to keep up, Jon. Or Aegon, as I suppose at some point we’ll have to start calling you. Sam Tarly (John Bradley) explaining to Jon that his name wasn’t Jon Snow and that he was actually the rightful heir to the Iron Throne might have felt anticlimactic had not Jon so obviously been in the dark about it. I’m always going to prefer the snappy dialogue scenes, but I guess it wouldn’t be Game of Thrones if there weren’t at least one really horrifying death by fire. Strictly speaking, I suppose little Lord Umber (Harry Grasby) was dead when they burned him. Still, eek. Cersei (Lena Headey) using and abusing Euron Greyjoy (Pilou Asbæk) was almost Noel Coward-level fun. “You might be the most arrogant man I’ve ever met. I like that. But now I want to be alone." Also fun, of a different kind: Yara Greyjoy (Gemma Whelan) knocking down Theon (Alfie Allen) when he came to rescue her, then helping him up, and freeing him to head to Winterfell while she goes off to unseat their wicked uncle. Awkwardest moment of a night of awkward moments that included Jaime Lannister (Nikolaj Coster-Waldau) spotting Bran (Isaac Hempstead Wright) in the wheelchair he essentially put him in: Dany realizing, too late, that Sam, whom she’d come to thank for saving the life of Jorah Mormont (Iain Glen) was the son and brother of two men she had executed by fire-breathing dragon. And this is why queens never go anywhere without advisers to brief them. And also a reminder, in case we needed one, that Daenerys, like her father, is a mite too fond of fire. We’ve known, haven’t we, that Jon was going to have to climb aboard a dragon sooner or later? Still, that ride through the canyons was very Star Wars (“you’ve completely ruined horses for me”), and almost made up for the slight cheesiness of Jon and Dany canoodling by a waterfall under those burning dragon eyes. So was it everything you’d hoped it would be?